This hiking trail is probably the flattest and easiest route we have developed, with plenty of interest along the way. 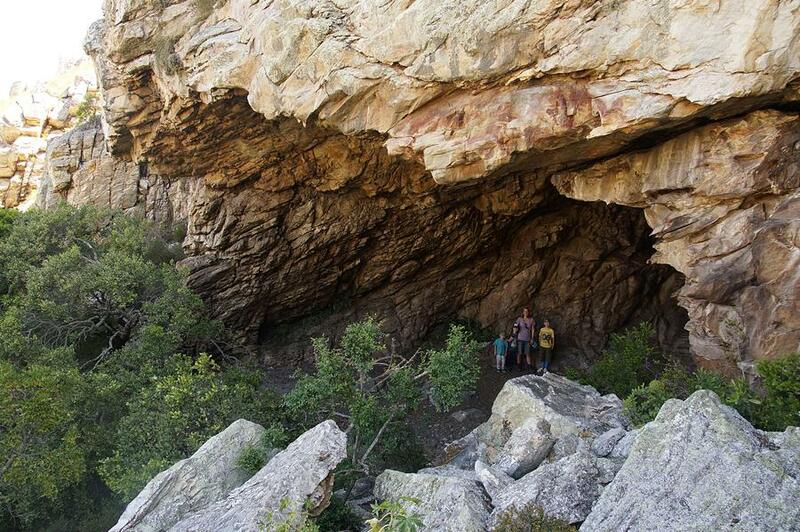 Additionally, the Rock Art and Heritage Site in Phillipskop Cave, above the Waterfall, is a big draw, making this our most popular trail. The path starts at the parking area near our reception and follows a jeep track to the eastern boundary of the property. The track contours around the hillside, so is relatively flat and suitable for nearly all abilities. As it approaches the eastern boundary it curves around into the beautiful steep-sided Candlewood Valley. The jeep track finishes at the Picnic Tree, an endearing and rather fantastical Rock Candlewood, Maytenus oleoides. There are branches at just the right level for children to clamber on. 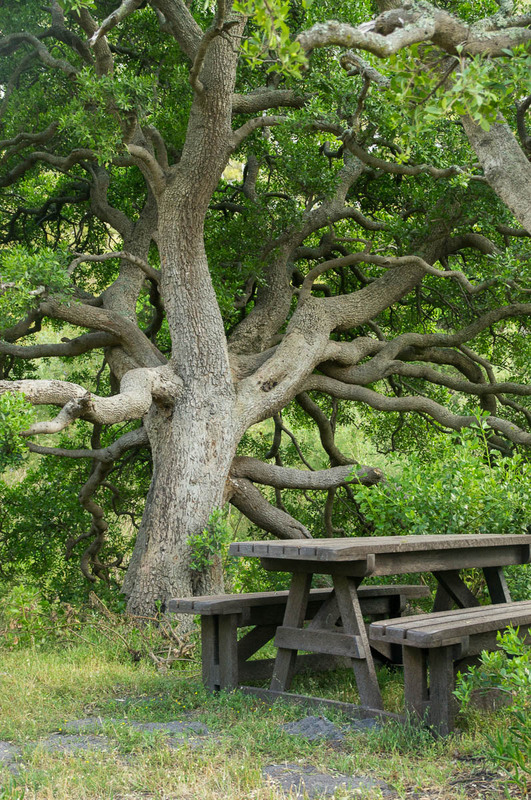 We have put a picnic table here as well, a lovely spot for a shady picnic or snack break. From this point a narrower path follows the side of the valley towards the waterfall. 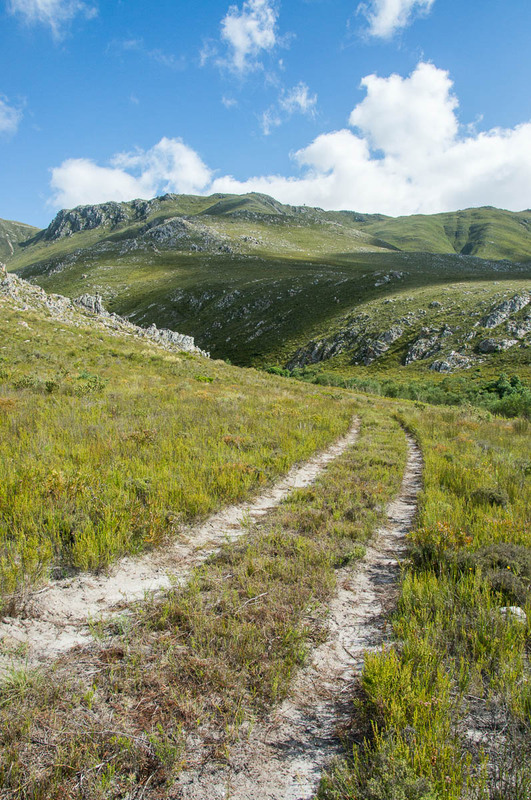 Although the terrain is slightly rougher than the jeep track, the path is perfectly possible for most people. 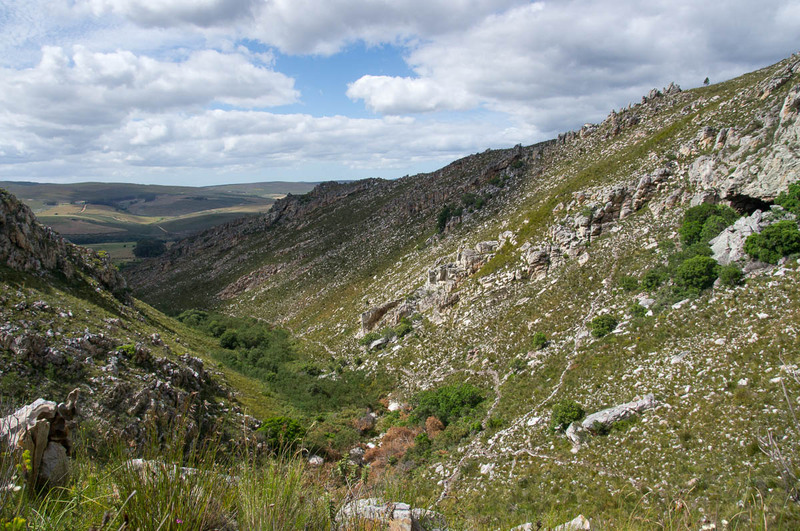 As you walk up the valley you can see Phillipskop Cave (or at least the trees that partially hide its entrance) part way up the left hand slope, and you will eventually get your first view of an impressive rock stack above you. This is Goliath, our tallest rock stack, reminiscent of something you might see in the Cederberg. You will need to climb above the waterfall to see the smaller rock stack, David, facing Goliath from across a stream. The waterfall itself is hidden until you round the last corner. Although it is usually little more than a trickle, and there is no large pool at the base for swimming in, the area at the bottom of the waterfall is sandy and great for children to play in safely on a summer’s day - even in the summer the base of the waterfall is in shade until about midday. From the junction just before the waterfall you can climb up to Phillipskop Cave. This large cave was a declared heritage site in 2016 due to the presence of rock art - the only recorded rock art on the Cape Whale Coast. The path up to the cave is quite steep, with loose rocks underfoot – many people feel more comfortable with a walking stick (we have some available for you to borrow from Reception). In the cave you can view and enjoy the Khoe-San rock art (but please ensure you/your children do not touch or damage the paintings in any way). The cave itself is big enough to shelter in on a wet or windy day, or if you just need a bit of shade. You can easily imagine the Khoe or San living there thousands of years ago. From the waterfall and cave you can return to the car park the way you came, heading back down Candlewood Valley. Alternatively, at the junction just before the waterfall, take the path up to a viewpoint above the waterfall. If you continue along this path you will be able to see the smaller rock stack, David, to the left of Goliath. We recommend walking all the way to the stream at the base of David, as this is a really beautiful spot. From here you can return to the car park via the Rock Stacks Hiking Trail, which takes you over the crags above Phillipskop cave, and down past Castle Rocks. 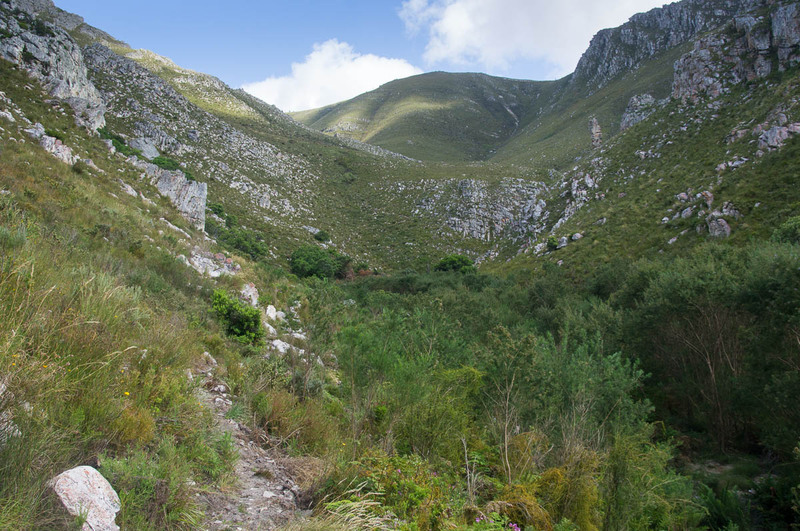 Or you can continue on into the Hidden Valley behind Phillipskop, heading around the mountain and up to the Saddle. We have introduced 6 Geocaches along the Waterfall Trail / Rock Stacks loop. Why not turn your walk into a treasure hunt and try to find these? 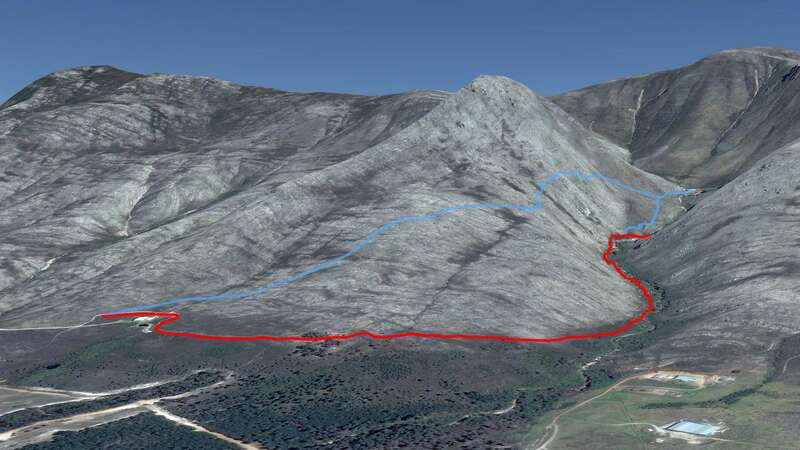 Route map of Waterfall Hike in red, showing Phillipskop and ridge of Klein River Mountains in the background. Alternative return route via Rock Stacks Hiking Trail shown in blue. cave, hike, hiking trail, map, Maytenus oleoides, picnic, rock art, rock candlewood, rock formation, rock stack, Stanford hiking, walk, waterfall. Bookmark.